A vegan Cranberry Breakfast Bread is the perfect way to start a holiday with family and friends. 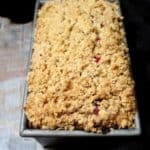 The tender crumb has tiny bursts of tart, juicy cranberries and nutty pecans. You can also bake this into muffins. A vegan, soy-free recipe, can be nut-free. Preheat the oven to 350 degrees Fahrenheit. Oil and flour a a 9 X 5 loaf pan. Mix the streusel ingredients until the mixture resembles large breadcrumbs. Set aside. Mix the apple cider vinegar and almond milk and set aside for a couple of minutes to curdle. In a bowl, mix the flour with the baking powder, baking soda, flaxmeal, salt and sugar. In a larger bowl, whisk together the applesauce, nondairy milk, butter and vanilla extract. Add the dry ingredients to the wet in two batches, mixing thoroughly with a spatula after each addition. Fold in the cranberries and walnuts, if using. Scrape the batter into the loaf pan and smooth the top with the spatula. Sprinkle the streusel on evenly. Place in the preheated oven and bake 1 hour and 20 minutes or until a toothpick inserted in the center comes out clean. Cool thoroughly on a rack before unmolding. Slice and serve. To bake into muffins, bake in a 12-cup muffin pan for 25 minutes or until a toothpick inserted in the center of a muffin comes out clean.